Join us Saturday, May 11, for a hike at Tolay Lake Regional Park, Sonoma County's newest park. The park, located at 5869 Cannon Lane, Petaluma 94954, is off Lakeville Highway about seven miles southeast of Petaluma. Plan to arrive by 9:45 AM for a prompt 10 AM departure. This moderate hike of almost nine miles, with elevation gain/loss of 1000 feet, will be on ranch roads, trails, and grasslands. Views, weather dependent, may be seen of San Pablo Bay, San Francisco skyline, and various Bay Area Peaks. Bring a lunch with water, wear weather appropriate clothing, and remember we hike rain or shine. The Sonoma Index-Tribune story about our 18th anniversary hike can be accessed here. Please click here on Cold Weather Hiking to view a Press Democrat winter hiking article featuring Bill & Dave Hikes. If you would like to be added to our e-mail list for monthly announcements, please send your request to fmi@sonic.net. Both of us are relative newcomers to Sonoma Valley, having spent our early years in the flatlands of Michigan and Ohio. As a result, we are fascinated with the Bay Area Mountains and enjoy introducing their beauty to others. The views from the Mayacamas and Sonoma Mountains surrounding Sonoma Valley are stunning. We graduated March 25, 2000 from the Valley of the Moon Natural History Association and the California State Parks volunteer training program and have been leading free monthly hikes ever since. More than 10,000 hikers have participated in our hikes during the past 18 years. In December 2005 we became volunteer hike leaders for the Sonoma County Regional Parks. We strive to acquaint hikers with the natural beauty and resources of the more than 15,000 acres in our local county and state parks. Our free, local hikes usually begin at 10 AM on Saturdays. Many of the hikers who join us each month have been participating for 10 years or more, and attendance averages approximately 40 people. Our hikes have become a social event as much as a hiking event. Our moderately strenuous hikes are good for both the body and soul. We hike rain or shine, so be prepared. For those of you who plan ahead, our 2019 future hike schedule is June 15 (North Sonoma Mountain), July 4 (Bald Mountain Fireworks fundraiser), August 10 (Shell Beach), September 7 (McCormick Addition), September 21 (Brunch on Bald fundraiser), October 5 (Sugarloaf), November 16 (Jack London), and December 7 (Annadel). We lead three annual fundraising hikes that are organized by Sugarloaf Ridge State Park. They are the "4th of July Fireworks Hike", "Brunch on Bald", and "Headwaters to Headwaters" fundraisers. Space is limited and reservations are required. They provide much needed revenue for Sugarloaf Ridge State Park which is now operated by Team Sugarloaf (they receive no funding from the State of California!). "Bill & Dave Hikes" (excluding the Yosemite Road Trip, and the San Francisco Road Trip) are sponsored by Sonoma County Regional Parks, California State Parks, Team Sugarloaf, Bay Area Ridge Trail Council, and Valley of the Moon Natural History Association. Each spring, the week-end before Memorial Day week-end, members of our group take a road trip to Yosemite for three days of hiking on Friday, Saturday, and Sunday. This is not sponsored by the Valley of the Moon Natural History Association, the County Parks or the State Parks, but you are welcome to meet the group at the trail head each morning at 8:45 AM for a prompt 9 AM departure. These day hikes are more strenuous than our regular hikes. If you've had trouble hiking with us to the top of Hood Mountain, Bald Mountain, or Sonoma Mountain then you are not quite yet ready for this adventure. Typical schedule: On Friday we hike to the top (1872' gain) of Nevada Falls. On Saturday we relax with an easy hike past Mirror Lake and along Tenaya Creek. On Sunday we hike to the top (2558' gain) of Yosemite Falls. Please make your own room/camping reservations anywhere in the park by calling 888-439-5003. Yosemite room reservations should be made one year and one day in advance at 7 AM for best selection. The 2019 hike dates are May 17-19 and one of the organizers is Scott Lewis who can be reached at 707-322-7668. The group will have a barbeque/potluck at his Housekeeping cabin on Thursday at 5:30 PM, and he will post a note on the bulletin board adjacent to the check-in office with the site number. The group will choose hike routes at that time. It's been 10 years since Dave Chalk and Bill Myers attended classes to become State Park docents and were looking for a way to volunteer four hours a month to the park system. They decided organizing and leading hikes would be a good way to accomplish this. Despite scoffing by professionals who didn't think the public would take to it, the monthly hikes have become a huge success. Bill and Dave are an unlikely pair. Dave was a high school mathematics teacher from Michigan who grew up in a suburban setting, participating big time in Boy Scouts. He and his two sons are Eagle Scouts. As he was growing up, "Go outside and play!" was the first thing Dave heard in the morning. "I was outside much of the time, sometimes more than I wanted to be, but gradually grew to love it," Dave recalled. As a teacher, Dave spent most of his week days indoors, but come the weekends and summers, "I was a Boy Scout leader and spent time with my sons on camping and High Adventure trips." Dave and his wife Joan retired and relocated to Oakmont in 1998 as a temporary move to help his father. Dad rallied with his family around, and the couple liked the area enough to stay. Though his father eventually passed away, the Chalks live here full time and travel to the Midwest as often as possible to visit family. Besides their two sons, the Chalks have a daughter and four grandchildren. In addition to the Dave & Bill Hikes, Dave also volunteers with LandPaths and as a math tutor at Santa Rosa High. Bill Myers comes from a very different life path, growing up in Ohio and finding success as an engineer working with electric utilities throughout the country. He started his own business in 1986. After living many places in the United States, he wound up in San Francisco, moving to Novato and then Petaluma before a real estate agent showed him property in Kinnybrook, high on the hill behind Kenwood Winery, in 1994. "I fell in love with it instantly." Myers said. "I just had to have it." Surprising to some, but not to those who know the 61-year-old Myers, there are no panoramic Sonoma Valley views from his home. He won't cut down the mature oak and madrone that surround the place. Myers lives with his high school sweetheart, Linda Pavlak, the couple reuniting after more than 30 years apart. Never an avid hiker, Myers was literally scared outdoors. "To be honest, it was a heart scare, angina and angioplasty in 1991, that motivated me to start hiking," Myers said. "Up to then, it was all business, cigarettes, pizza, and no exercise. I had my epiphany after that. I also realized it was time to pay back by giving people from the Kenwood area encouragement to get out and see the area." The Bill and Dave combination has proved to be durable and successful, with other spin-off groups now offering organized hikes throughout local parks. 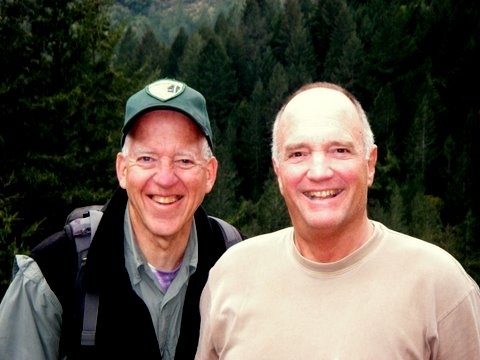 Bill and Dave are docents for state and regional parks, guiding hikes at Jack London, Sugarloaf, Annadel, Hood Mountain, Spring Lake, and Shiloh. They also organize an annual three day road trip to Yosemite and recently held an inaugural city hike in San Francisco. While staying healthy and enjoying the beautiful scenery is a big plus, it's the people who make the job worthwhile. "The thing that means the most to us is the people we've met and long lasting, good friendships we've developed," said Dave. There are over 1000 names on their e-mail list, with an average hiking group of 40 people. Over 80 joined in the San Francisco hike last month. As in any groups, surprising connections develop. There have been at least two marriages and several long-term relationships that have begun on the trail. Most hikers are between 30 and 70, with kids joining in on occasion. Hikes run from the very tame - at Spring Lake - to extremely hardy - from the valley floor to the top of Yosemite Falls or up Goodspeed Trail from the entrance at Sugarloaf to Hood Mountain. Bill also leads monthly hikes through the Kunde Vineyards. "Kunde hikes have grown into something cool," he said. "I put several bottles of wine in my backpack and as we pause in a vineyard, we uncork a bottle and drink the wine that came from those vines." The California State Parks will honor the intrepid hikers' ten year anniversary at a May 15 ceremony in the picnic area across from the day use parking lot at Sugarloaf Ridge State Park, starting at 10 a.m. Then they will lead a hike to Bald Mountain, duplicating their inaugural May 20, 2000 hike. If you're interested in joining Bill and Dave Hikes, check out their website at www.billanddavehikes.com. Please call Dave Chalk at (707) 539-8847, Bill Myers at (707) 833-6288, or contact us at the link below for further information or to be added to our e-mail list. Send Bill and Dave an e-mail.